John Francis O’Shea, an Irish footballer, born on April 30, 1981, is known for playing defense on field. He was also the vice-captain of the Republic of Ireland national team. Before making his official career debut with Manchester united, at the age of 17, he played for Ferrybank AFC and Waterford Bohemians. He made almost 400 appearances over a decade and won 15 trophies at Manchester United that include five Premier League titles, one FA Cup, three Football League Cups, UEFA Champions League and the FIFA Club World Cup. He made his debut in 2001 with the Irish national team against Croatia and after the debut has made a little over 100 appearances for the national team. He is married to Yvonne Manning. The young O’Shea, at 17 years of age, signed with Manchester United and played his debut match against Aston Villa in 1999 during the Football League Cup. Manchester United lost 3-0. After complete his loan spells at Bournemouth and Royal Antwerp, he came back to Manchester United by the 2002-03 season. He displayed a skillful attitude during this season. O’Shea earned the third position in the PFA Young Player of the Year. During the 2003-04 season, after Rio Ferdinand’s suspension, O’Shea took up the mantle at central defense and helped United reach the FA Cup Final where they won 3-0. In the 2004-05 season O’Shea displayed a very nonchalant behavior but despite a somewhat disappointing season the highlight was the 4th goal that O’Shea scored against Arsenal by chipping the ball from the 18-yard box. O’Shea was further pushed into the spotlight after Gary Neville suffered an injury in the 2004-05 season but he was severely criticized due to his dull performance. In 2007 in a match against Tottenham Hotspur, Edwin van der sar was substituted with O’Shea because he suffered a nose injury. O’Shea stopped a goal from Robbie Keane and the fans chanted “Ireland’s number one” to show appreciation. a month later he won many hearts by scoring a goal against Liverpool. He also scored against Everton, rescuing the team, winning the game 4-2. O’Shea had an accuracy of 100% and 80% of his kicks were netted. His versatile personality on field provided United with a lot of advantage as they used him as a backup striker in the 2007-08 season. By the 2008-09 it was common to see O’Shea substituting defenders due to injuries. In 2009 he scored his first goal of the season against Derby County. O’Shea started the 2009 Football League Cup Final. During the 2009-10 Premier League, O’Shea captained his team for the second time. He also scored against Stoke City on 29 September 2009 by a header, this also happened to be his 350th appearance. He captained for the third time in 2010-11 UEFA Champions League in the 2nd leg of the semifinals against Schalke. United won. He has made an accumulated 393 appearances for Manchester United. 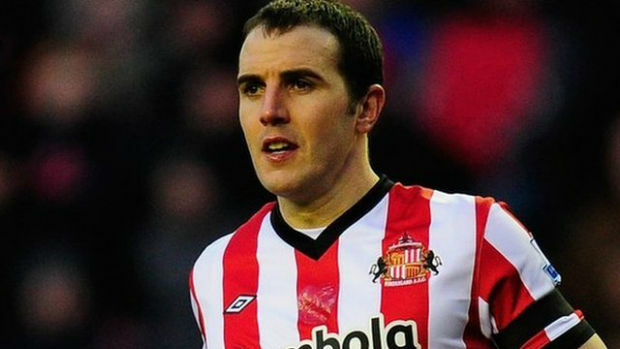 In 2011, O’Shea signed a four-year contract with Sunderland. He made his debut in a friendly match against Arminia Bielefeld, O’Shea suffered a hamstring injury and was ruled out for pre-season. He later made an appearance in a match against Swansea, which was a goalless draw. O’Shea scored his first goal with Sunderland in the 2012-13 season but still lost against Tottenham Hotspur. O’Shea earned his first senior cap in 2001, he was substituted in the 84th minute. He failed to score a penalty and the game resulted in a draw. He was soon included in the 11 starters of the game and has claimed the defensive slot on the Irish team. In 2003 he made his first international goal which helped Ireland win against Australia in a friendly match. In the 2010 World Cup qualifying, O’Shea was present in 8 out of the 10 games Ireland played. He made nine appearances in the UEFA Euro 2012 qualifying. In 2013 he opened a World Cup qualifying victory over Kazakhstan of 3-1. On 14th October 2014, he scored as equalizer against Germany, it was also his 100th cap.